KWAJALEIN, Republic of the Marshall Islands (March 01, 2011) -- There's a lot of American military history in the Kwajalein Atoll -- on Kwajalein itself, and Roi-Namur in the northeast side of the island chain. Most of that history involves Operation Flintlock, part of America's World War II Pacific campaign during which the U.S. military captured the atoll from the Japanese on Feb. 7, 1944. Today, remnants of that operation and of the Japanese occupation of Kwajalein remain buried all around the atoll. Leslie Mead looks through her Kwajalein's collection of memorabilia and World War II and U.S. military related ephemera. When construction starts on a new project at Kwajalein, it's the job of Leslie Mead, Kwajalein's in-house archeologist, to ensure appropriate care is taken to recover and process any artifacts found. "Basically, every time we dig something, I have to be around to take a look at it -- anything that's greater than 6 inches below grade and within the confines of the island prior to 1945," Mead said. Her facility houses relics of the war: weapons, clothing, personal effects of both Japanese and American military personnel, dog tags and even human remains. "Most of what we find these days is from World War II -- for example, a Japanese gun we excavated on Roi- Namur this past year," she said. "It came out of the fill deposit. Right after World War II, they were looking for dirt or anything else that they could to bring the island back online as an American base. They took a lot of Japanese stuff and just dumped it in the ocean. 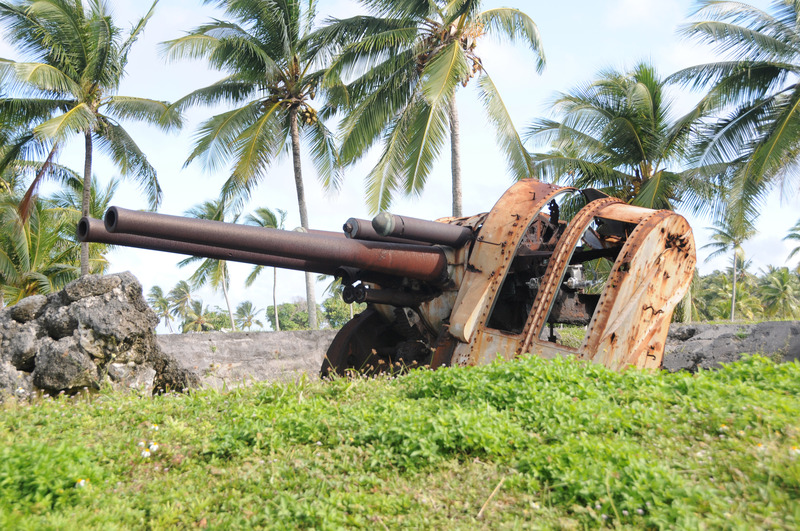 This is one of the things they dumped in -- a Japanese anti-aircraft gun." Mead also finds bones on the island. Part of her work is to confirm if the remains are American, Japanese or Marshallese so they can be sent back to their home countries to be repatriated. Most of the remains, she said, are of Japanese soldiers. "We're not primarily interested in identifying a single individual, but rather trying to confirm what we strongly suspect -- and that is that they are Japanese," she said, while handling a plastic envelope with a bone fragment and documentation inside. "They will be repatriated to the government of the Marshall Islands, who will in all likelihood repatriate them to the Japanese." Dog tags are also a common find on the island. Mead says when they find dog tags they try to locate the Soldier, if he is still alive, or find his Family, so they can be returned. Sometimes, however, they run into problems. "We actually contacted an individual several years ago and let him know that we had found his dog tags, and he denied that they were his," she said. "He acknowledged that yes, he was in the Army, and yes, he had been in the Marshall Islands, and yes, he was on Kwajalein. But they were not his dog tags!" She has a theory as to why the former Soldier didn't want to claim what was his. "Maybe he's concerned the Army will come after him for losing his dog tags 65 years ago," she said. "Or, it was a fairly common practice to take your spare dog tag if you had a relationship with a local girl and there might be consequences from that relationship, to give her your dog tag. If there were consequences after you had left, she would be able to contact you." On Roi-Namur, weapons systems still stand that were once owned and operated by the Japanese for use during their occupation of Kwajalein. Mead's facility houses several glass cases to display some of the finds. One pair of cases has sets of American and Japanese World War II-era gear, so visitors can compare the two. "We wanted to have sort of some analogous things in the case so people would be able to understand the difference between the two different types of soldiers," Mead said. "If you look at the American case, virtually everything is standard Army issue. That's reflective of the fact that the World War II Soldier was the best-equipped Soldier that had ever fought. Virtually everything that he was given and had was issued to him by the Army." The Japanese soldier's kit included things donated by the community, she said. "You'll see there are a lot of very idiosyncratic things in here besides the ordnance," she said. Included in the case for the Japanese soldier was a jar of hair pomade from the Tokyo School of Beauty, and a Japanese Imperial Navyissued rice bowl. "We find them all the time," Mead said. "It's sort of the equivalent of an American mess kit." Mead also has a collection of glass bottles exhumed from trash dumps used by the American servicemembers stationed on the island after the war, including beer and liquor bottles. Mead explained that back then, American enlisted Soldiers were limited in the amount of alcohol that could be in their beer. "You can tell the enlisted man dump from the officer's dump, because the officer's dump had the liquor bottles," she said. 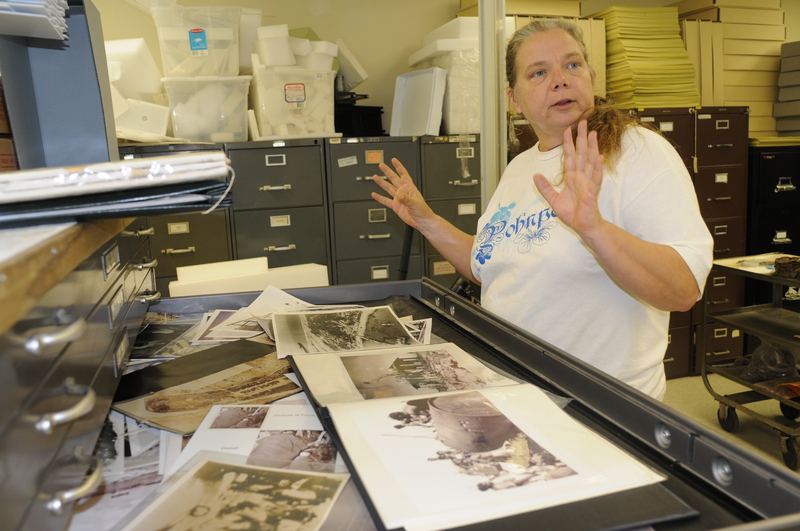 Mead is more than just the archeologist for Kwajalein -- she collects its history as well. She has thousands of pictures related to the island's history, and newspapers and magazines published about the military mission on Kwajalein -- some even published by the military on Kwajalein. A Sailor's handmade scrapbook that Mead purchased online is among the collection's most prized pieces. "We call it the Reckinger scrap book," she said. "He was here in 1945 and 1946...with the Seabees. There are all kinds of things in here: pictures of Kwajalein, pictures of home, a beer ration card, a cigarette chit and his chow hall pass." The book also includes a photo of the war-crimes trial for the Japanese commander of Kwajalein. 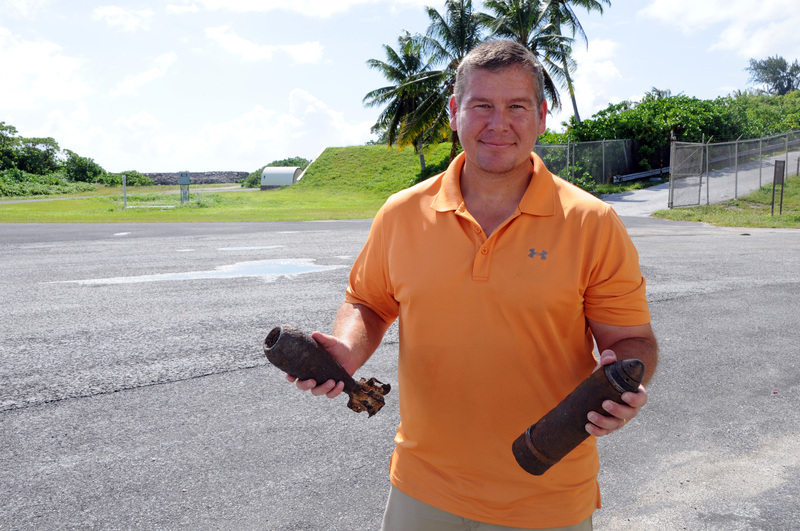 Brian Bussey serves as an unexploded ordnance technician on Kwajalein. "This is the only photo we have," she said. "That's when they tried the commander of Kwajalein...for killing the Makin Raiders here." The Makin Raiders were Marines who attacked the Japanese holding Makin Island (now Butaritan Island) in August 1942. After inflicting heavy Japanese casualties and taking out enemy radios, the Marines withdrew. However, due to a combination of broken boat motors and heavy surf, several Marines were stuck on the island. The Japanese captured them and brought them to Kwajalein for execution. Mead can't keep everything she finds, though. Some things are simply too dangerous. "The hardest day I ever had was when I had to take a full canvas bag that was part of a Japanese soldier's uniform, that had hung from the belt, with the canvas still on it and still full of bullets," Mead said. "I had to turn it over to EOD (explosive ordnance disposal) for destruction -- I can't keep live rounds here. But my favorite boys in the world are the EOD boys, because they keep me alive." Brian Bussey is one of the unexploded ordnance technicians who works with the EOD team. "Most EOD contractors conduct what they call 'walking the grid,' which is just going out on the ranges and digging up areas," Bussey said. "We basically respond to any kind of incidents that are called in. People are digging and they find a UXO (unexploded ordnance), or they are walking along the street and find a UXO. We also go out and do sweeps to look for UXOs." As a result of Operation Flintlock, Bussey said, the entire Kwajalein Atoll is full of UXOs. "That resulted in a lot of ammunition, over 100,000 tons of ammunition just from the Allies," Bussey said. "That doesn't even account for the Japanese ammunition that was here." Bussey's team averages about 54 UXO-related incidents a year, or about one a week. "About half the stuff we find is still considered hazardous in some form or fashion," he said. "It still contains explosives or a functional fuse. Some of the items, especially the Japanese, do not require fuses to be dangerous. Instead, they use picric acid as a main charge filler. And picric acid is extremely sensitive over time." Bussey said a big part of his and his team's mission is to keep the residents safe, including the archeologist. They do that though public awareness and safety campaigns, including public service announcements on the American Forces Network channels and education programs in the schools. "We attribute our public awareness more to the safety (campaign) than to us going out and finding things," he said. Through the efforts of EOD and their local archaeologist, Kwajalein residents can be certain that the atoll's history is safe and sound.